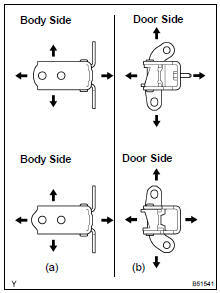 (b) Adjust the door by loosening the body side hinge nuts. (c) Tighten the body side hinge nuts after the adjustment. (h) Connect the negative (-) terminal cable to the battery. (j) Check the SRS warning lamp (see page 05-1207 ).